PITTSBURGH, Oct. 4, 2018 /PRNewswire/ -- Simcoach Games and the International Union of Operating Engineers Local 66 release a pair of free mobile video games -- available in the iOS app store, Amazon Appstore, and Google Play Store, designed to build awareness to career opportunities as heavy equipment operators. Video game connects youth to potential careers in construction. 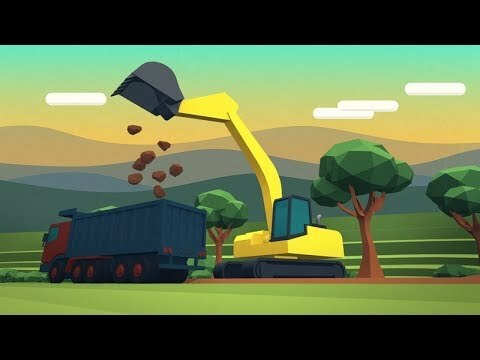 Dig In: An Excavator Game and Dig In: A Dozer Game put players in the seats of heavy equipment to attempt challenging tasks and levels. Players move dirt and rocks, bust up boulders and concrete, dig and fill holes, all while trying to work efficiently and avoid causing damage. The game features bonus levels of 'excavator-style' soccer, basketball and golf. As players progress through each game, they receive messages connecting them to real-life construction apprenticeships. "We are promoting new gaming apps to help educate youth about working in construction," says Jim Kunz, Business Manager for Local 66. "When kids download and play the games, we are hoping to pique their interest in learning more about available apprenticeship programs and careers available to them." Veteran operating engineers and expert trainers in Southwestern PA informed the design of the games. After consulting with subject matter experts, Simcoach Games followed an iterative development process, involving several rounds of prototyping and playtesting with high schoolers. "Our game development process is what leads to engaging and effective games," says Jessica Trybus, Chief Games Officer and Founder of Simcoach Games. "We aim to expose and inspire kids to possibilities. Our focus is on 'finding the fun' - to do this we prioritize involving youth in making the games." Simcoach Games is a Pittsburgh-based technology spin-out of Carnegie Mellon University, dedicated to creating video games that inspire and connect the workforce of tomorrow to job opportunities. Since 2005, Simcoach Games has partnered with Fortune 500 organizations across industries to produce games that reinforce critical skills and help players discover their abilities and interests. Simcoach Skill Arcade games have attracted more people, including women and minorities, to various fields. Visit www.simcoachgames.com. For over 100 years, the International Union of Operating Engineers Local 66 has provided contractors with competent and qualified Operating Engineers and Operating Engineer Apprentices. Local 66 represents over 7,600 members who work in the field for contractors, private businesses and municipalities. Local 66 is educating youth and students on construction and believes it is key to our industry's future. Learn more at www.iuoe66.org.